Nine startups have prevailed among more than 200 applicants from 20 countries and are now in the final of Innovators‘ Pitch 2019. They will have the opportunity to convince an expert jury of their innovative ideas and technologies in the fields of Digital Learning & EdTech, Digital Mobility and Digitial Supply Chain on 10 April at hub.berlin. 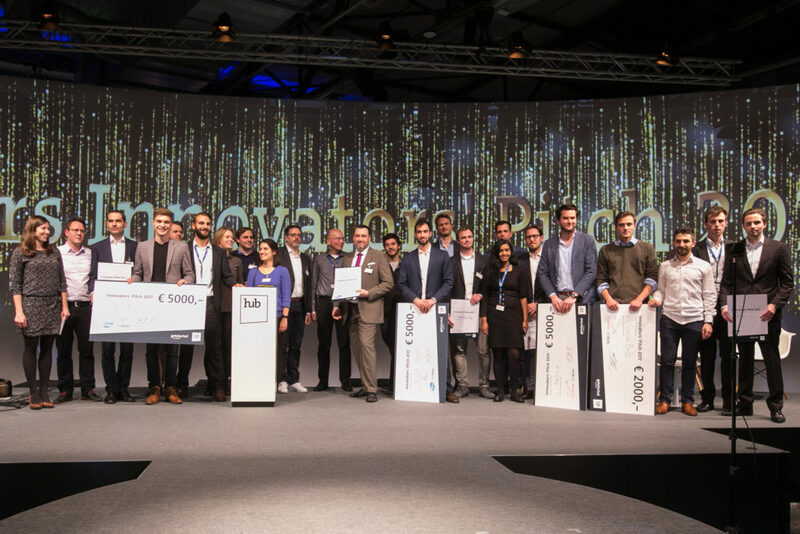 The winners of the 13th Innovators‘ Pitch will receive prize money totalling 15,000 euros as well as other attractive prizes. „Education, mobility and logistics are three areas, in which digitisation is currently showing particularly great dynamism. Startups shape developments and will have a decisive influence on the way we live,“ says Bitkom Managing Director Niklas Veltkamp. „hub.berlin provides inspiration from digital experts as well as tangible technology and offers innovative startups exactly the right audience and the right stage. Foldio: The startup Foldio develops intelligent educational toys for children. A Foldio consists of paper that has been printed with sensors and conductive tracks. This paper can be folded and brought to life by a minicomputer. Kids Booky: The Kids Booky learning application uses mixed and augmented reality to support children with learning disabilities. Animations stimulate the children’s attention so that they can better focus on the learning content. StudySmarter: StudySmarter is a learning platform for digitising exam preparation. The All-in-One platform helps students to create and share learning content. AIPARK: AIPARK offers AI-based real-time parking maps. For this purpose, the startup has developed a cloud platform combined with IoT sensors that provides predictive and real-time information about the availability of parking spaces. ONO: ONO has developed an e-cargo bike that provides an innovative solution for emission-free, more efficient and flexible urban transportation. Tracks: The startup Tracks has developed a platooning technology that enables trucks to find and connect with other trucks while on the move through real-time matchmaking. doks.innovation: The startup doks.innovation offers automated inventory management with the help of drones. These automatically generate data and ensure a continuous flow of information. evertrace.io: evertrace is a platform for all parties involved in a supply chain. With the help of IoT and blockchain technology as well as real-time tracking, evertrace maps the entire shipping process on a single platform. Kinemic: With the Kinemic band, contactless and simple interaction and operation of digital devices is possible using gesture control – only by moving the arm. The Innovators‘ Pitch is hosted by Get Started, Bitkom’s startup initiative. Partners of the award are among others Cornelsen, the SAP Startup Accelerator for Digital Supply Chain and Siemens Mobility. In addition to the prize money, the winners will receive access to company partners and participating investors, as well as a free GetStarted membership in Bitkom. All information is available at www.innovatorspitch.com. More than 5,000 international participants, 350 speakers and more than 1,000 startups are expected at hub.berlin on April 10 & 11. This year’s two-day business festival will take place under the same roof as the Big-Data.AI Summit, Europe’s largest conference on artificial intelligence and the data economy. In addition to keynotes and discussions on seven stages on topics such as blockchain, artificial intelligence or virtual reality, there will be two areas with practice-oriented workshops and, for the first time, a separate Policy Arena and a Digital Arts Lab. All information about hub.berlin and the possibility for startups to apply for free tickets is available at www.hub.berlin.